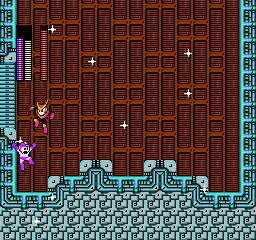 A heavy weapon hack for the NTSC version of Mega Man II. You start out with 1 free E-Tank in your inventory. Floor friction increased. Mega Man no longer slips and stops immediately after you release the D-Pad. 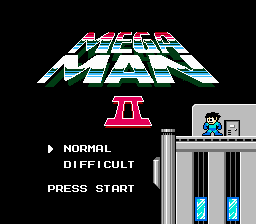 Mimics the response from other Mega Man titles like 4 or 5. Items 1, 2 & 3 are infinite. This was done to avoid going back and forth some screens just to fill up the gauge to get over a certain portion of a stage. Weapon usage reduced. Every weapon shoot will only take 1 ammo consumption. Crash Bomber modified: The detonation is now done remotely, by pressing the B button. 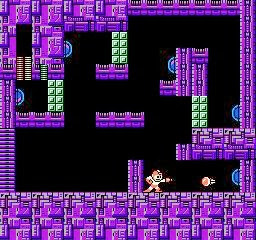 This helps a lot in a particular stage in Wily’s Fortress. Atomic Fire modified: The charge time has been reduced, it now charges twice as fast. 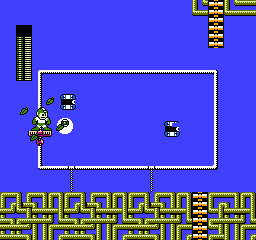 This patch fixes nearly every gripe I’ve had about Mega Man 2, namely the unbalanced weapon energy consumption. No more farming for refills! Also the added weapon functionality is a welcome improvement, especially the remote Crash Bombs. I no longer dread The Wily 4 gun wall boss. Tighter controls also a plus, not slipping off the edge of narrow platforms. Excellent work on this, I am very grateful! Glitch fix for falling off of ladders after unpausing. Weapon switch using Select button.